The Pillars of Eternity II: Deadfire is Obsidian Entertainment’s follow-up to Pillars of Eternity, their splendidly successful and critically acclaimed 2015 RPG entry. The original Pillars of Eternity was hailed for its return to the “glory days” of RPGs with its isometric perspective and Dungeons and Dragons-style gameplay methodology. For adoring fans of the first title in the series, Deadfire proffers much in the same vein, wielding powerful storytelling, immersive environments, and strategy-thick gameplay that directly satisfies almost all the cravings of their player base. While some titles reroll the die and start over with a fresh, non-linear story in their second entry, Deadfire is a direct descendant from the first The Pillars of Eternity. Such a direct descendant, in fact, that you can import your save data from the original if you played it. Your save data will directly impact your Deadfire gameplay, and if you don’t have any, Deadfire will ask you to make some choices about what your history would have been in the previous title so as to inform your future in this one. Deadfire works very hard in the introductory segment to refresh you on what happened in the previous entry, then plops you into the gorgeous world of Eora. It’s five years after the events of the first game, and now a supposedly-dead god has risen and destroyed your home, Caed Nua. Just for good measure, he takes a chunk of your soul with him, and another god strikes a deal with you to restore your soul if you figure out what’s going on with the rogue god as he terrorizes the land. Deadfire, aptly named, is set in the Deadfire Archipelago. 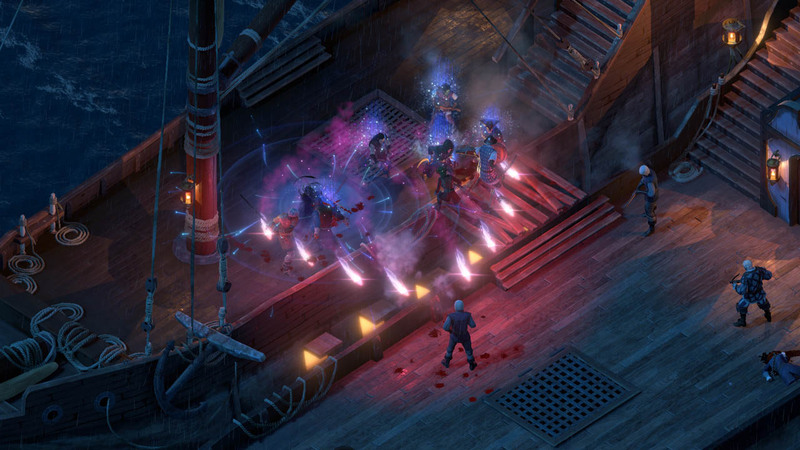 The swashbuckling, seafaring navigation is new to the Pillars of Eternity series. Traveling between watery locations has you engaging with a minigame of sorts, which forces you to stock your ship with not only crew members, but supplies. If you stumble across an enemy ship as you’re traveling from quest point to quest point, you have the option to try and flee or to take it on in battle. These battles are turn-based and reliant on how well you’ve prepared your ship. You’ll be given a series of options regarding how to maneuver, then on how to attack. If you win, it’s great for ship morale, but beware if you lose. This naval novelty is an interesting take on how to travel in an RPG, and it hits a sweet spot for those who love pirating adventures. Its overall gameplay loop, however, lacks a complexity and depth that would have brought it up to par with the main one. Deadfire isn’t quite turn-based, but it isn’t quite RTS, either. It’s a hodgepodge of mechanics that CRPGers will recognize and quickly understand, but newcomers may scratch their heads at. Your party members have a given class assigned to them, and within that class they have abilities which they can use. When you enter a battle, you have the option to let your characters run completely on the AI you set for them — or, if you enjoy the micromanagement and/or are playing on a higher difficulty level, you’ll want to manually command each one of your characters for each move. To do so, you have a pause function that allows you to freeze the battle and direct your party members for movement, skill use, item use, and so on. If you do choose this route, know that you’ll probably be pausing every second or so as the battle progresses, and occasionally the field gets so hectic and the spells so overwhelming that you may not even be able to see what’s going on. Practice makes perfect. But, as with any good RPG, battling is only half the fun that Deadfire offers. The real meat of this title lies in its rich storytelling and its abundance of side quests and places to explore. Quests offer tantalizing amounts of experience for your party members, so there’s plenty of incentive to go probing through households that aren’t yours and talking to people you don’t know. Every action has a reaction in Deadfire, and note that while you progress, you’ll find different factions speaking differently to you based on your previous actions and things that you’ve said. As you travel the Deadfire Archipelago, there are many things to encounter and see — many of which are completely optional. You don’t have to go investigate that burial pile, potentially for loot. You don’t have to help a sorry sap get his money back from the woman who beat him up. You don’t have to let every rabbit hole sidetrack you into oblivion. But if you don’t get some sort of small joy out of pursuing a side quest down to its core and getting a delicious reward back, it’s probable that you’re not going to really appreciate what Deadfire has in store for you. Deadfire is a visual splendor that is backed by vibrant storytelling, superb voice acting, and memorable sound design. However, if you don’t know what you’re in for, Deadfire has a high probability of completely baffling you. Even though it spends a substantial amount of time in the beginning explaining to you what happened in the first title, newcomers to the series will constantly be reminded of the massive quantity of lore they’ve missed. There’s simply too much from the first entry to explain to alleviate this problem, especially when certain optional party members are even originally from Pillars of Eternity, complete with lengthy stories of their own. The same issue is present with the gameplay mechanics. For CRPGers, Deadfire is a snap. Some may even complain that it’s too easy. For non-CRPGers? Deadfire’s explanations are vague and minimal, leaving you with lots of questions you’ll probably have to explore elsewhere to find the answers to. The ability to change the overall difficulty level on the fly helps significantly, but it’s not going to satisfy the player that really wants to understand and enjoy Deadfire’s gameplay, but can’t because of messy battle visuals and too few tutorials. Even if you’re one of the many standing outside the Pillars of Eternity’s club doors and looking longingly within at the already-initiated, Deadfire’s overall quality and excellence is clear. It struggles with long loading screens and perhaps fewer cutscenes than it could do with, but the writing is engaging and the sheer amount of voice acting is commendable on its own. Graphically it’s gorgeous, and characters inspire you to interact with them and to remember them for a long time after. Deadfire is a colossal title that stretches far beyond its main plot, providing hours of gameplay for the player that loves to simply get swept away in the flood of wonderful storytelling. The Pillars of Eternity II: Deadfire scratches every itch computer roleplaying gamers could possibly muster, and more. Its staggeringly beautiful world weaves an elegant tapestry upon which its story is stitched — a story that, ultimately, is your story. Deadfire’s gameplay and lore isn’t exactly welcoming to the uninitiated, but for those in the know, it’s a striking entry for the genre that delivers in more than just a few aspects.